I was intrigued when I started this book, and from start to finish, it was a weird journey, which captivated me and held my attention, you really need to get your hands on the hardcover editions that was released last year, need one convincing reason to purchase it? 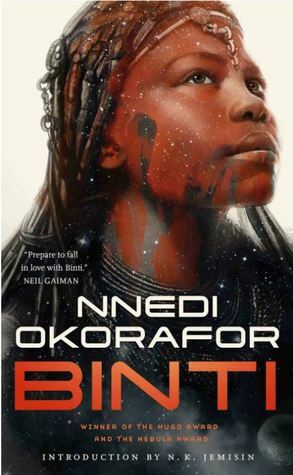 The beautiful foreword in Binti is written by the one and only N.K. Jemisin. Binti is the first book of Nnedi, that I am reading and I am happy to say her writing style is easy to follow and it very inspiring. I liked the character Binti, I love how her zeal for knowledge and curiosity is displayed in this book, it’s a great introduction to knowing who Binti is as a character. The world building is great, and there’s a lot of things to learn and understand about the people, especially as this vibrant world that has been built, doesn’t only consist of humans but different species, from different planets or so it seems. It gets to a point where the story feels hazy and everything is happening in a manner that doesn’t seem to be timely, but I enjoyed the dialogue that was exchanged. It didn’t take me up to an hour to finish this book, and I can’t wait to read the next book in the series and get a wider and better understanding of the world Binti lives in. Special shoutout to Tor Publishing, who I’m thankful for! I got sent the beautiful books in the Binti series (hardcovers mind you), in exchange for my honest review. Have you read this book already? What are your thoughts on it? It’s on your TBR? Tell me about your plans for this book. I have read Zahra the Windseeker by Nnedi Okoroafor and I loved it. I have major respect for authors that are able to merge worlds. I have been looking forward to reading Binti and hopefully, I get to do it soon. I enjoyed this review Lara! I don’t have this on my TBR but I do have Akata Witch on my TBR. Great review. I’m glad you enjoyed this book. The hardcover books are stunning. I think I need to reread this series.